Inspired by Amy at Life Zimplified, I’m going to make it a habit to laugh more during the month of December. I realize that this is a terribly vague habit, and therefore hard to follow, so I’m going to spend some time each morning, over the next month (in the warm summer air, under the Chilean sun!) writing funny things in my journal. Funny things happen all the time, but I’m usually going so fast I don’t stop to notice. For example, yesterday, in my English Language Learner class of 1st graders and Kindergartners, we were talking about transportation, and I asked, “What’s your favorite form of transportation?” And one little boy said, “How do babies come out?” Another kindergartner, without missing a beat, said, “Yeah. How does the mom get them out of her?” Cue me, trying not to burst out laughing. Kids are hilarious most of the time. I have no idea how these boys went from thinking about planes and cars to babies, but it was obviously a burning question that needed an answer (I did the best I could; I thought it went pretty well). 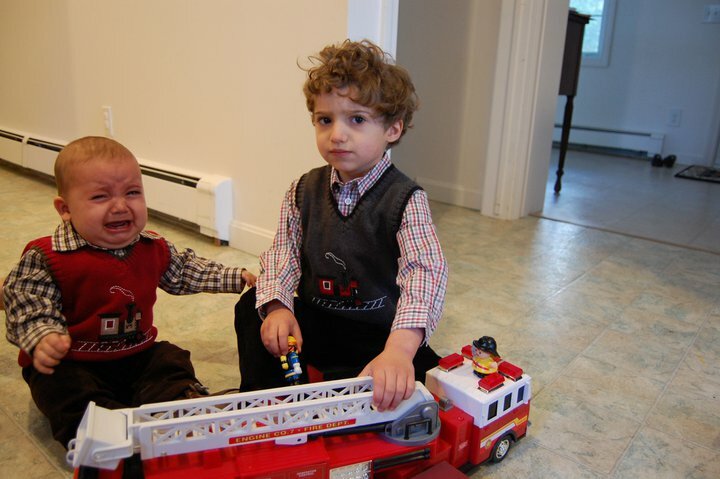 These same little boys find everything hilarious. They laugh constantly, and it’s so adorable that I join in. We all feel, instinctively, the benefits of a good laugh. Remember when you were a kid, and you laughed all the time? As adults, we slowly laugh less and less. But in those rare occasions when we do “lose it” to laughter, our muscles relax, our bodies flood with endorphins, and levels of stress hormones drop in our bodies. Laughter also increases our ability to withstand pain. Apparently, even fake laughter will affect the body in similar ways to real laughter, or will turn into real laughter shortly after, and our body will receive the same beneficial hormones. There’s nothing I love more than to watch people I love laugh. My mom, on the rare occasion when she thinks something is really funny, laughs until she gets tears in her eyes. She usually laughs so hard that she falls out of her chair. It’s impossible not to burst into laughter just watching. 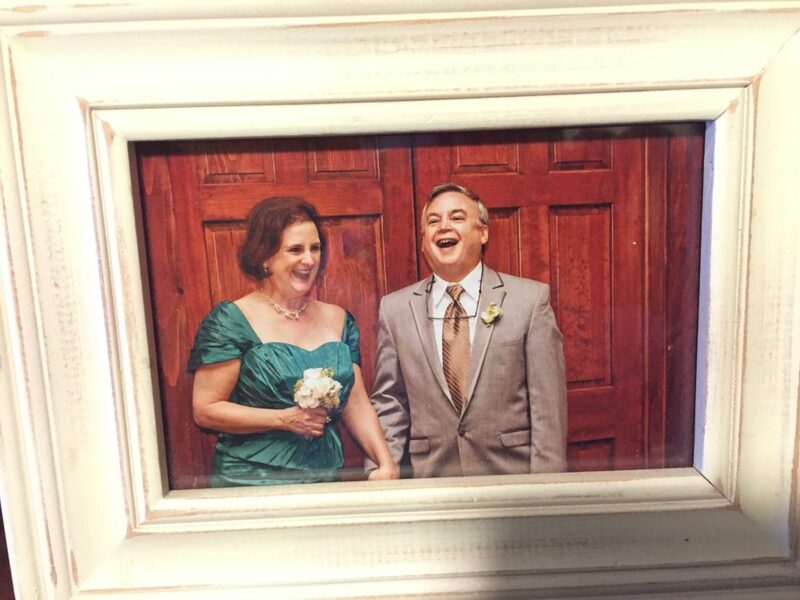 This picture of my parents laughing sits on my bedside table. My son is the same way. When he really finds something funny, Mr. ThreeYear and I inevitably burst out laughing too. And when one person is in a jovial mood, laughing at everything around him, others laugh more too. According to Robin Dunbar, an evolutionary psychologist at Oxford, there’s an evolutionary reason for this. There’s a growing body of research to suggest that “laughter contributes to group bonding and may have been important in the evolution of highly social humans.” Perhaps this is why Mr. ThreeYear loves to laugh so much. He’s a very social being, and is incredibly skilled at building bonds with others. He also laughs and goofs around a lot, especially at work. Over the years, he’s been able to create very successful teams at his workplace because of his ability to underpin the serious work environment with levity and humor. Habits have helped me be more productive, happier, and less frustrated over the years, since I don’t have to think about those every day behaviors that I’ve put on auto-pilot: hanging up my keys on the key rack as I come in the door, writing first thing after I wake up, putting my desk supplies back after I finish using them. In his book Happier, Dr. Tal Ben-Shahar talks about creating rituals. He recommends that instead of trying to cultivate more self-discipline, we should instead define “very precise behaviors and perform them at very specific times, motivated by deeply held values.” For example, brushing your teeth is a ritual and doesn’t take any special self-discipline to complete. Hygiene is a deeply held value for many of us, so brushing our teeth is something we do each day. Making an activity part of your daily life and making it value-based, rather than discipline-based, is an excellent way to create a lifelong habit. Charles Duhigg, author of the excellent book The Power of Habit, breaks habit formation down further. 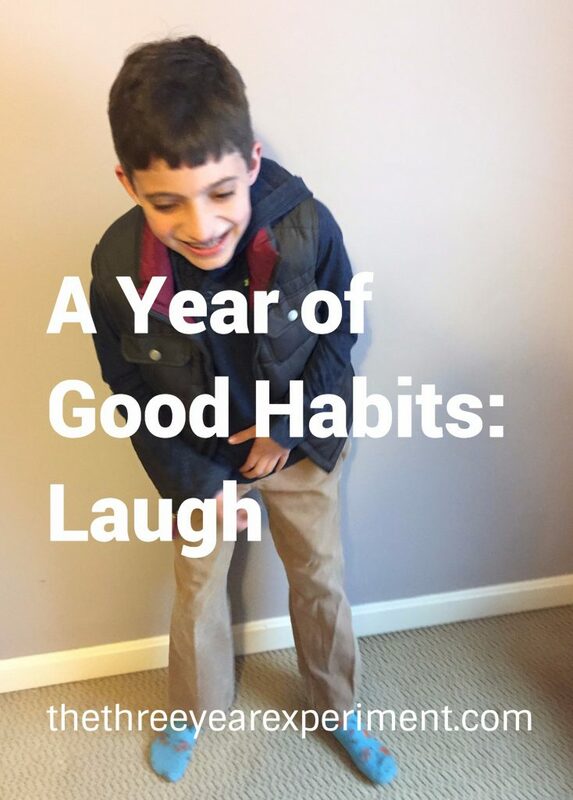 He explains that habits have a predictable cycle–cue, behavior, and reward. We experience a cue (walking into the basement from the garage), engage in a behavior (hang the keys on the key rack), and experience the expected reward (a feeling of contentment that their keys are in their place, and I will be able to find them tomorrow). Experts say the way to change habits is to keep two parts of the cycle the same–the cue and the reward–and change the behavior. Once you’ve done that, then you’ve effectively changed the habit. In order to help myself laugh more, I’ll need a cue. My trusty journal will have to serve as my cue again–I’ve used it to help remind me to be more grateful in the past as well. Another cue I might use is a picture of someone laughing in the kitchen, to remind me to take the time to notice the humor around me and approach the world with a more light-hearted attitude. Don’t forget to let me know what you think next year’s year-long experiment should be! I’d love any and all ideas for keeping our family on track to decrease our (sometimes rampant) spending and increase our net worth over 2018! Thanks for the shout out, Laurie! There is not much more precious than children’s laughter. Great habit to incorporate. Oh, and I love the family pics. Your mom must be fun! I 100% agree, Amy! We’ve had a lot of opportunity to laugh with family on our trip to Chile. 🙂 Hope you had a wonderful Christmas!